You may have read my values page on "order" [Link]. "A place for everything and everything in its place." When I am needing to use something [tool, glue, screws, etc] I am sooooo happy and fulfilled when I know exactly where to find it. When Tránsito joined the Scampy Team, we saw immediately the potential to completely fulfill all of our goals for order. However, now that our order value is so very, very close, what now? the best way for her Blog readers to be clued in on what happened to her since she stopped Blogging several years ago. We met a couple in the parking lot of the Fred Meyer in the City of Beaverton, Oregon. We really hit it off! The guy is a Viet Nam Vet. I asked if he had a tough time over there? [He looked as though he had.] He revealed that he did have it rough over there [POW]. We all talked together for over an hour. They were driving a long, tall Mercedes RV that did not have an RV appearance from the outside. I asked to take a peek inside. That Mercedes is really decked out! In my opinion, their Mercedes RV could park/camp nearly anywhere without being ID'd as an RV! As we parted, they mentioned that this evening they were thinking about camping in a National Forest dispersed camping area. That seemed like a good idea. 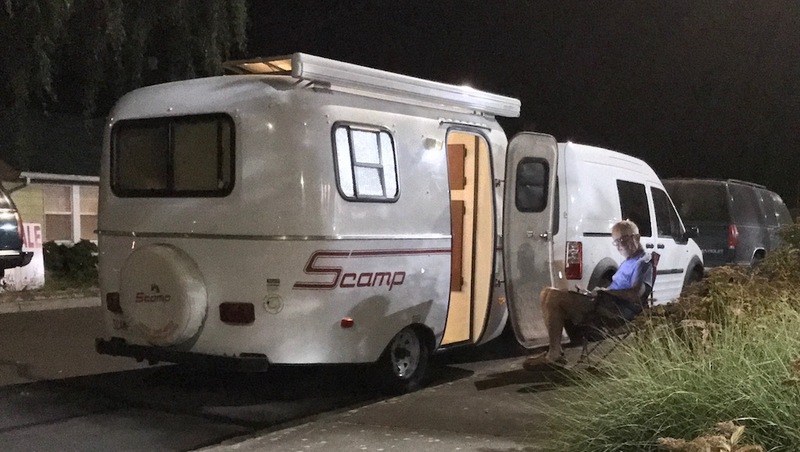 So, the Scampy RV Team headed east out of Beaverton looking for a nice forest! We traveled awhile. Then Tránsito announced that he was a bit low on fuel. Tránsito wanted to go to a Big Rig truck stop. So, we did! When Tránsito was all gassed up, Baby Boid began making that sleepy look that he makes if he is not put beddy-bye at the right time. We scouted the area and located a good Nite Camp in a residential neighborhood. We intend to return to this Nite Camp site around 11pm. Then we went to make an Evening Camp [Link] and put Boid to sleep. George is outside right now watching the PBS News Hour. There will always be another project, George...100% sure of that fact! My husband's 2nd home is Home Depot! Your husband is definitely my kind of guy! Has he ever been concerned about not having something to do? Never!! Our house is about 60 years old; a never-ending project. We have a little Casita and getting ready for a big trip later next month. We'll never be bored, whatever that is! My wife and I were divorced when our kids were just starting high school. One thing we recognized, and worked together to minimize, was the negative impact it has on children. Even if one parent was the only villain, kids tend to think they are the cause of divorce, even if you assure them otherwise. Keep in mind that today kids are on the Internet. Even if one of these parents was really bad, rehashing it on the Internet by complete strangers (I know George isn't a stranger to the kids) may not be a good thing, it may even be damaging to the kids; especially if other kids at school read about their personal lives and start teasing and bullying Rowena and Eddie's children. George, thank you for the up date on Weng. I don't need to hear anymore. I appreciate the fact that she is alive and well and still your friend. I wish her well. Instead of breaking more things on Scampy and incurring more costs, how about offering your skills in fixing things to other campers? That way you could fulfill your fix-it needs and keep Scampy intact. There are lots of us other campers around who do not have your skills! Just between you and I, this George guy does not actually go around breaking stuff just to be busy and happy.